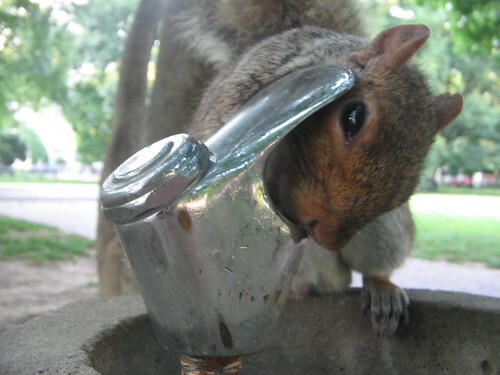 Walking home from work yesterday, I ran into this squirrel eagerly sucking water from a fountain in Lafayette Park, near the White House. I pressed the button on the fountain to see if I could give him a little more water, but the fountain was not actually working, so he’ll have to be satisfied with the drops he could get. I’d like to point out that he never ran off, even when I stuck the camera in his face or pressed the fountain button right by his head. Lafayette Fountain Squirrel is also featured in today’s DCist Morning Roundup, and was one of the Interesting Flickr photos of 06/06/06. ON one level, very cute. 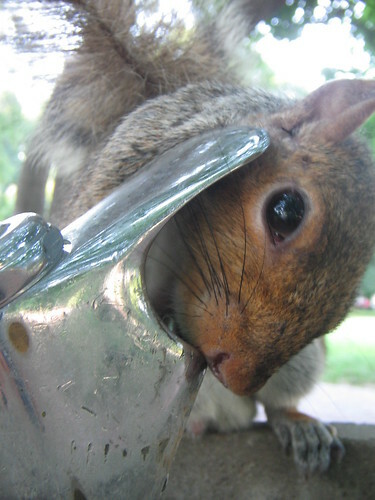 On another level, very scary, as I often drink from water fountains (“bubblers” for those from Rhode Island) in parks, and I know this little guy probably is carrying more than his share of germs, and his tongue on the nozzle is a great transfer mechanism. Maybe next time I’ll wait and use the water fountain inside the bus station.